Cerenia 24mg Tablets are a unique antiemetic that provides effective relief from sickness and nausea in dogs. 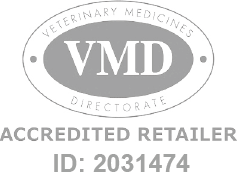 Cerenia Tablets - 24mg is a Prescription Only Veterinary Medicine and by law requires a prescription from your vet. Cerenia 24mg Tablets are a unique antiemetic that provides effective relief from sickness and nausea in dogs. Its unique mode of action treats vomiting induced by multiple causes, such as motion sickness, post-operative general anaesthesia sickness, and nausea caused by chemotherapy. When given as directed by your vet, the non-sedating effects of Cerenia begin rapidly and can last up to 24 hours, blocking the Neurokinin receptors in the brain to control nausea and vomiting. Presented in convenient tablets of 16mg, 24mg, 60mg, and 160mg dosages, Cerenia is easy to administer. Cerenia Tablets are manufactured by Zoetis and developed specifically for dogs. As such, they must never be used in other animals.